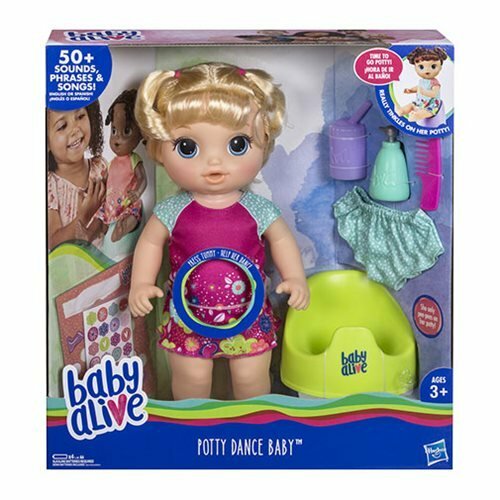 Baby Alive Potty Dance Doll is wearing big kid undies and she needs to go potty! Kids can share important moments with their baby by pretending to help her use the potty. When this doll is thirsty, fill the water bottle with water and give her a drink. Now it's potty time! Hold baby's hands and she'll do a potty dance. Help her on the potty and she'll sing and go "pee-pee!" Don't worry, the only place she goes is in the potty so there's no mess. Remember to pretend to wash her hands and put a sticker on her rewards chart to show her she did an awesome job! Little ones will love dressing this poseable doll in the included outfit, combing her hair, and listening to all the silly things this doll says. Doll includs outfit, potty, water bottle, pretend soap dispenser, undies, comb, and rewards chart with stickers.